Whew! What a whirlwind of a ride these last few months have been. I can hardly believe it’s already November, and we’re still in full swing. We’ve got our schedule filled with music lessons, student rock concerts, and even a FREE drum clinic with our drumming instructor Joe Costello. Be sure to check out the SMA Facebook Page for more details on that. When the school year began, Scottsdale Music Academy partnered up with Horizon High School (alma mater of our very own John Davis! to spread the word about our instructors and latest music events. High school students, along with parents and younger grade school kids, make up a large portion of the SMA population. 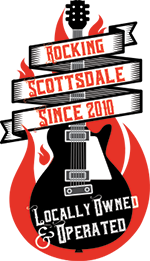 We really like to do our part to reach out to the community by being involved with local Scottsdale-based schools. We’re really proud of the high school students who take music lessons or band coaching at SMA. You can see it in their eyes and feel it in the way they play or sing that they are SUPER PASSIONATE about music. One of our very own voice students, Kathryn Ziegner just got her first song on iTunes called “Ghost” She’s been taking singing lessons with SMA instructor Jen Durkin. After listening to the song, Jen suggested adding a minor chord in the verse, an idea that Kathryn started working on and incorporated into the final product. Be sure to check out “Ghost” on Itunes. It’s an amazing tune! Another group of SMA high school students we’re proud to boast about are Nick Debeurre, Katie Gibbs and Reid Lyscio Within three short months, this rockin’ trio became a band named Saving Suburbia (such a cool name! ), booked their own gig, promoted it, created their own band logo, and even designed their merchandise! With this much drive and commitment, we’re bound to hear great things about them in the near future. Way to go, guys! These are just a few examples of the high school students that take music lessons at Scottsdale Music Academy who really, truly love music. Believe me, they’re making the world a better place because of their love of music. With them it’s PURE FOCUS. They don’t do anything but live, eat, and breathe music. They’re fighting for spots to come down to the Academy and rehearse their newest solo. They’re always asking for band coaching and advice on how to write a better song or how to master a challenging chord. They have this constant, never-ending hunger for playing music with other people. And they’re constantly talking about it. You can just tell – music is their everything. Does this sound like you or someone you know? Or maybe you’ve always wanted to try the drums or bass guitar, and you’re finally gathering up the courage to play? 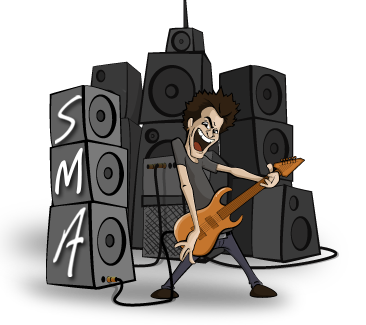 Whether you’re in high school, grade school, or the school of life, take a music lesson with one of our expert SMA music instructors. The first lesson is always FREE for new students. You’ve got nothing to lose! Who knows – maybe you’ll be the next student that we can’t help but brag about. Call us at 602-751-3537 to schedule your lesson today!